I know I always harp on about it. But I freaking love citrus. In the foods I cook/eat, beverages I like to drink, fragrances for my hand soaps and lotions, and even for decor. Since Key Lime Pie ranks among one of my top favorite desserts, I wanted to take it’s bright flavors and marry it with one of my other favorite sweet treats—Cheesecake! If you love citrus and limey things, this dessert is perfect for you! The tartness is fully pronounced but not overwhelming and the citrus-whipped cream is the ideal pairing. Sure, if you just “kinda” like the flavors of citrus, you could decrease the amounts of juice, zest, or extract. But what fun would that be? And with that my friends, thanks for reading and have a WONDERFUL MOTHER’S DAY WEEKEND! Combine the graham cracker crumbs, sugar and butter until moistened and resembles the texture of wet sand. Pour into a 9-inch springform pan and press crumbs into the bottom of the pan and about one inch up the sides. Bake for 8-10 minutes until golden and cool to room temperature. Using a standing mixer fitted with the paddle attachment, whip the cream cheese and sour cream until its light and fluffy. Gradually mix in the sugar. Mix in the eggs one at a time, beating well after each addition. Add the lime juice, lime extract and zest until well combined. Pour the filling over the cooled crust. Place the pan on the middle rack of the oven with a pan half full of hot water on the bottom rack of the oven. Bake for 50-60 minutes or until the center is set. Turn off the oven and allow the cake to sit in the oven with the door propped open for about 30 minutes. (To prop the oven door, I use a wooden handled spoon to keep it ajar a few inches). Remove from the oven and transfer to a wire rack. Allow the cake to cool for an additional 30 minutes. Wrap well with plastic film and foil. Refrigerate for at least 8 hours. Carefully remove the sides of the pan by running a hot knife around the outside of the cake. When you are ready to serve, prepare the whipped cream. Using a standing mixer fitted with the whisk attachment, whip the chilled heavy cream on high until it just holds stiff peaks. Slowly sprinkle in the sugar until you reach a thick consistency. Add in the zest and whip until combined. 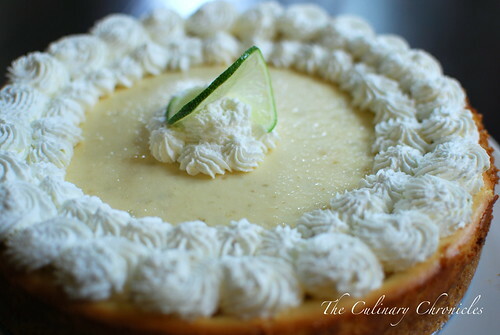 Pipe the whipped cream on top of the cheesecake and garnish with additional lime slices and zest. i love key lime. i have the ingredients to make this right now. i want to make this right now. alas i woke up this morning with a horrible head cold and even though i can imagine how wonderful it would feel on my throat and how fantastic it would taste, i know i would not be able to actually taste it. i’ll wait until i can. thank you for giving me something to look forward to. 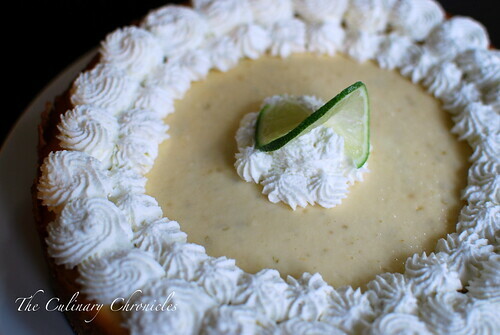 That is one gorgeous key lime cheesecake! What I wouldn’t give for a piece for breakfast right now, haha. Thank you for sharing this and inspiring me with something new! Have a great weekend. 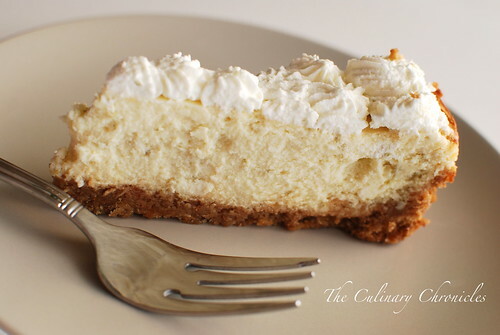 What a lovely cheesecake – it looks just like it came from some fancy restaurant! It sounds just delicious, also! Great photsos, thanks! 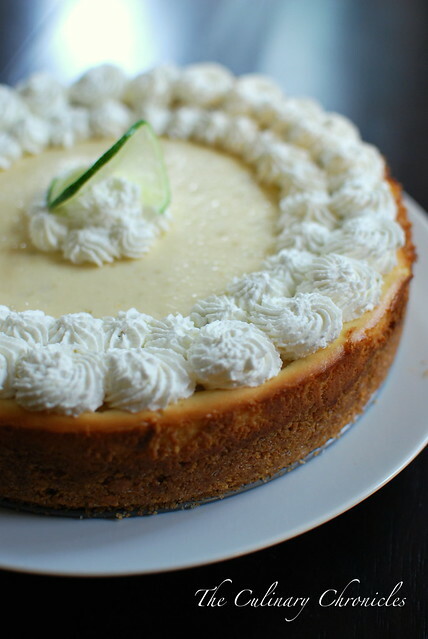 I made a key lime cheesecake for thanksgiving but it just wasn’t “limey” enough. I’ll use this recipe next time. I am a huge key lime lover. I would love to get me some key lime extract!! Sounds amazing. I have a question about the recipe. After baking 50-60 minutes, when you leave the cake sitting in the oven for 30 minutes, do you keep the oven on at 325, or turn it off? Hi Hannah! After you bake for 50-60 min, turn off the oven and then use a wooden spoon to keep the door ajar for 30 minutes. Enjoy!! Do you happen to know what brand of Key Lime juice it was that you used? I know you mention its from WS– my mother and I used to buy it there but it seems they no longer carry it. I know its not Nellie and Joe’s but I am hoping you remember the brand name!